Will has another harvest season and birthday under his belt. 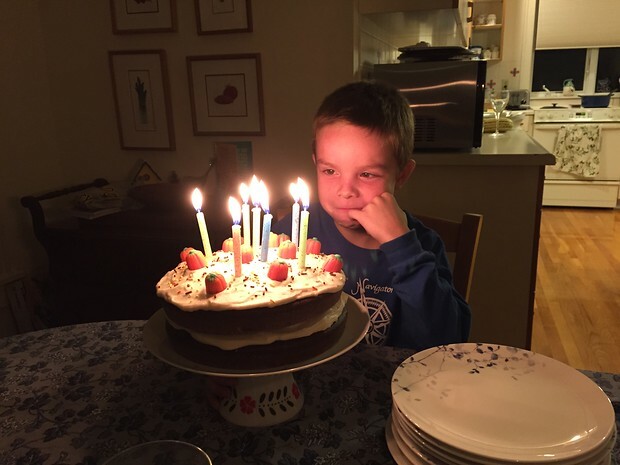 This year the birthday celebration seemed to go on and on, much to Will’s delight. In early October we made our annual harvest trip to Iowa City. Will spent the majority of the weekend riding in various farm equipment and enjoying being out with the men. We had a birthday celebration with Gramma Anne, Pop Pop Brian, and Larry. On his true birthday, October 14th, Will chose to go out for ribs and Ted Drewe’s for frozen custard, very St. Louis. It was delicious! The grand finale was a ninja/karate party with his friends and Vera and Faye. The party included lots of running, jumping, and obstacle courses, pizza, Will cutting his cake with a genuine sword, and breaking a board with his foot. What more could a 7-year old boy ask for?